One of the few remaining lots available in Big Horn Mountain Estates - a gated community comprised of Craftsman-style homes. Privately located on the east side of the subdivision, this property backs onto scenic Peach Cliff, a protected area for Big Horn sheep. 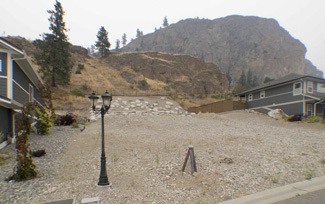 Gorgeous mountain views and a great view of Skaha Lake at the back. Excavation has already been completed with low-maintenance rock and gravel behind the building site. Excellent value with all services at the lot line and GST has been paid. No timeline to build and you can choose your builder. The purchase price includes house plans that have been approved by the developer.